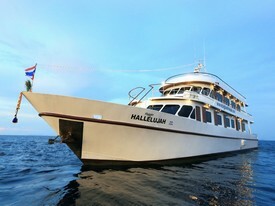 The M/V Hallelujah's large dive deck in the rear of the boat gives you plenty of room to set up and get in. The on board nitrox system allows nitrox certified divers to extend their bottom times with enriched air mixes. For those not Nitrox certified, we offer Nitrox certification on board, along with other courses such as deep specialty and photo specialty. Dive groups are maximum of 4 people (unless a group booking prefers to all dive together), and your gear is washed and your tanks are filled for you by our highly trained staff. Standard and DIN tanks are available on the boat. Standard Twin Cabins are located on the main deck. These cabins have large windows offering spectacular views of the passing scenery. The beds are arranged into bunk beds perfect for single travelers and couples alike. All Deluxe Double Cabins are also located on the main deck. They offer the same spectacular views with large windows within these rooms. These cabins also have en-suite facilities including hot shower, flush toilet and sink for your privacy and convenience. The VIP Single Cabin is the only cabin on the upper deck and has a large window down one side of the room. This cabin also has en-suite facilities including hot shower, flush toilet and sink. This is the most luxurious of our cabins offering the best views of the Similan Islands. Rates are per person, based on double occupancy cabins. When possible, we will allow individual customers to have their own room. However during busy times we may need to put 2 individual customers in the same room. If we need to combine individual customers in cabins, we will only do male-male or female-female pairings for reasons of privacy. If you require your own personal cabin, we offer it at a 85% surcharge. Private cabins are not available during Christmas and New Years. Every person diving in the Similans is required to pay national marine park fees in cash at the time of the trip. We will collect these fees from each passenger on our departure day so they can be paid upon our arrival in the Similans. Cost for this will be 2,000 Baht per person. We have diving equipment available for rental, or we can order equipment for you through our suppliers and have it ready for you upon your arrival. A complete set of equipment is 750 Baht per day without a dive computer or 1000 Baht per Day if you need a dive computer. The use of dive computers for each person is mandatory on liveaboard cruises do to the high number of dives offered in a short period. Email us if you have specific requirements or would like to see a list of equipment available for purchase. Other than that, everything else is included in your trip except alcoholic beverages, available throughout the trip and paid for on the last day.